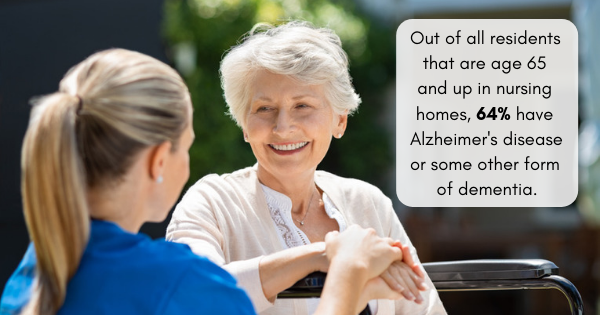 Out of all residents that are age 65 and up in nursing homes, 64% have Alzheimer’s disease or some other form of dementia. In fact, 52% of individuals turning 65 years old will require some form of long term care during the course of their lives. If you’re concerned about the episodes of forgetfulness that you or a loved one experienced, here are three ways to help you differentiate between normal forgetfulness and signs of dementia, according to the Alzheimer Society of Canada. 1. The Ability to Remember Details. Memories of long-ago events fade over the course of time and it may be the brain’s way of creating room to store new memories, as Manor Grove explains. If you’re having trouble remembering the details of an event or a conversation that occurred last year, that’s most likely normal age-related memory loss. However, if you’re unable to remember the details of conversations or events that happened recently, that may be a cause for concern. 2. The Ability to Remember Names. We all forget names from time to time. If you run into an acquaintance and draw a complete blank when trying to recall the person’s name, that’s a part of normal aging. On the other hand, the inability to recognize family members or remember their names may be a sign of a more serious issue. 3. The Ability to Find the Right Words. Everyone occasionally struggles to think of the word they’re trying to say. This is usually a normal memory lapse. At the same time, frequently pausing to find words or frequent word substitutions might be a reason to seek help. If you’re finding yourself having a hard time remembering the details of events long past, the name of an old acquaintance, or the right word to say, you’re probably showing symptoms of the normal aging process. Forgetting recent events, forgetting the names of family members, or frequently struggling with words may indicate a more serious condition such as dementia. Have a talk with your doctor and get their opinion. If necessary, discuss your options for long term care facilities, rehab facilities, and skilled nursing facilities. One last word of advice: If your family is concerned about your forgetfulness and you aren’t, it’s a good idea to make that doctor’s appointment. If you’re concerned about memory lapses but your family isn’t, there’s more than likely no reason to worry.